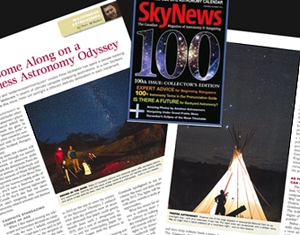 Here, you’ll find the locations I’ve covered in the Wilderness Astronomer column I write in each issue of SkyNews: The Canadian Magazine of Astronomy & Stargazing. Each guide below includes a link to more information on observing sites, events, dining/accommodation, and other information about each destination I couldn’t fit in the print column. To get the actual magazine column itself, you can find SkyNews on many newsstands in Canada (including newsstands at WalMart), subscribe to it, or buy a digital copy here. Jan/Feb 2013 – Waterton Lakes National Park Could this be North America’s first “cross boarder” dark sky preserve? In this issue, I check out the Albertan neighbour of America’s Glacier National Park. Nov/Dec 2012 – Elk Island National Park Check out Canada’s “drive through” dark sky preserve experience and see why as many as 5,000 people have flocked to this post-urban star sanctuary outside of Edmonton, AB. And see Elk Island (along with Jasper) featured in my other sometimes-magazine-gig in the April 2011 issue of Canadian Geographic. Sept/Oct 2012 – Point Pelee: Gateway to the Southern Sky Sitting on an eight-kilometre-long dagger’s tip of lush Carolinian forest jutting out onto Lake Erie, Point Pelee National Park is farther south than Rome and parts of California. in fact, the park — a dark sky preserve since 2006 — is the southernmost part of mainland Canada. Check the resource section below for a guide to the locations, events, and experiences mentioned in my recent column on this location. July/Aug 2012 – Gordon’s Park: Ontario’s darkest skies? A breezy day-trip from Toronto or most other major Ontario cities, the world’s only privately-owned dark sky preserve (as of 2012) is also the place where you might just see the darkest skies in the province. Check the resource section below for a guide to the locations, events, and experiences mentioned in my recent column on this location. May/June 2012 – Jasper National Park: The ‘Disney World’ of dark sky preserves From the thundering waters of Athabasca Falls and the majesty of the Columbia Icefield, Jasper is isn’t just the world’s largest astronomy park, it’s perhaps the most incredible stargazing experience in Canada. Check the resource section below for a guide to the locations, events, and experiences mentioned in my recent column on this dark sky titan. Mar/Apr 2012 – Bruce Peninsula National Park: Stargazing in Canada’s shipwreck capital Journey to a place where the corpses of dead ships gaze up with “polar fleece startgazers” at some of the darkest skies in Upper Canada. Check the resource section for a guide to the stops mentioned in the column. Nov/Dec 2011 – Grasslands National Park: Grand Prairie Skies A look at Canada’s flattest dark sky preserve and what could possibly be the darkest, steadiest seeing at any observing site in the nation that you can drive up to. Resources in the link below include URLs for the many tourist destinations, accommodations, events, and observing locales mentioned in the column.